Hey all, Knight Ware is mixing things up again. Google sheet link is below to help coordinate teams. William Kim has agreed to judge. Playtest cards are per team and not by format. Each team can start with up to 20 of them, see below for more info. 100% store credit payout which includes any extra that may get taken in for additional playtest cards needed. This is NOT unified, decks CAN share card names. Legacy and Vintage will follow normal rules for their respective formats. Please don’t erase names/teams that are not yours. There is a section (to the right of the main signup area) for interested players without teams to indicate their interest. Decks/single cards will be available to borrow if needed, just let me know. 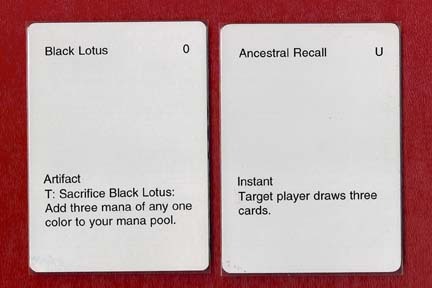 Playtest cards are those cards in your deck that have been used to substitute for other cards that you don't have. They must be "clearly identified" as to which cards they represent. Please don't use copyrighted artwork. Removing text with acetone or an eraser and using an extra fine point sharpie pen to cross out the irrelevant text and write the real text is the best approach. what's the meta at knightware usually look like? Here is a link to decklists for our previous legacy/vintage events. Many thanks to the 9 teams (27 players) who attended. This is the who got what post with meta and decklists to follow at the bottom. Location: Knight Ware Inc. Studio City, CA.